The differences between 2 travelers can be huge! 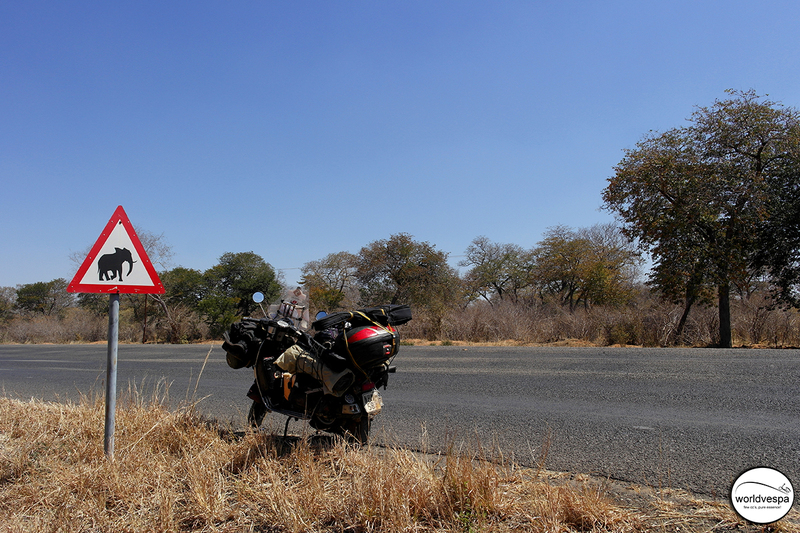 Before I left from Livingstone, I talked with a tourist from the USA (a girl about 24 years old) who warned me that I would find difficulties in crossing the borders between Zambia and Botswana (annoying guys who would try to sell me things etc). For one moment, I started considering it as a problem but when she told me that it would take me about 1 hour to cross the borders, I realized that the word “difficult” is not the same for everyone…6 hours is a difficulty, 1 hour is not! 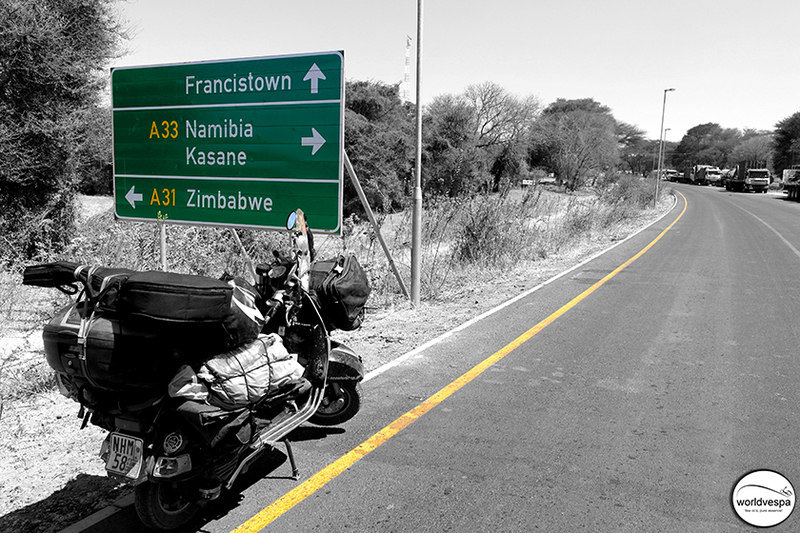 Crossing the borders of Zambia to enter Botswana was the easiest thing to do (the boat took me some time, but everything else was quick and easy). No one caused me any problems and even the guys who were selling currency wouldn’t come towards me unless I had called them. I don’t know, maybe it’s the beard that has grown too long and people are afraid of me! Or maybe I’ve become so used to the way of life in Africa that I don’t take any notice of these things. My goal was to get to Nata. I wouldn’t visit the National Park of Chobe because the cost for the entrance to the park is very high, as everyone told me. 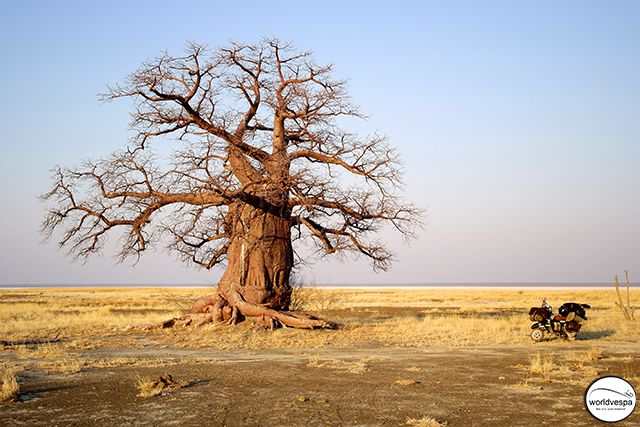 My plan was only to visit Etosha National Park in Namibia. 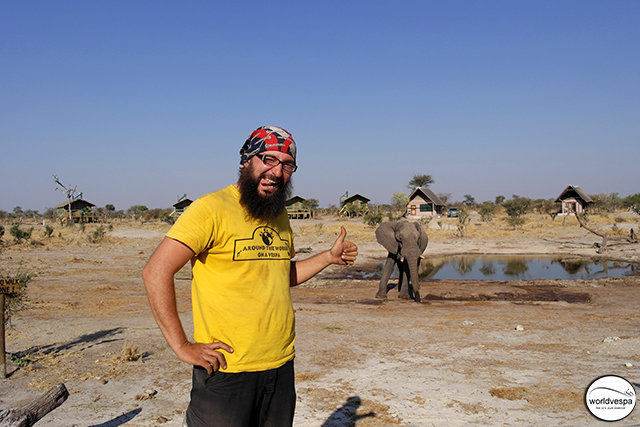 I was informed that about 50kms before Nata, there was a nice campsite where I could stay and very close to that campsite, there was a waterhole where elephants came to drink water. It is nice to be able to take as many pictures as you want from a close distance! Only 1-2 kms after Pandamatenga and as I was ready for the last 160kms, I chose to go a bit faster so that I would be at my destination before the night fell. The last few hours, I had been hearing a metallic sound coming from the engine and the moment I accelerated, the sound became louder and the engine suddenly stopped. After some minutes, I started the engine again and it worked without a problem. 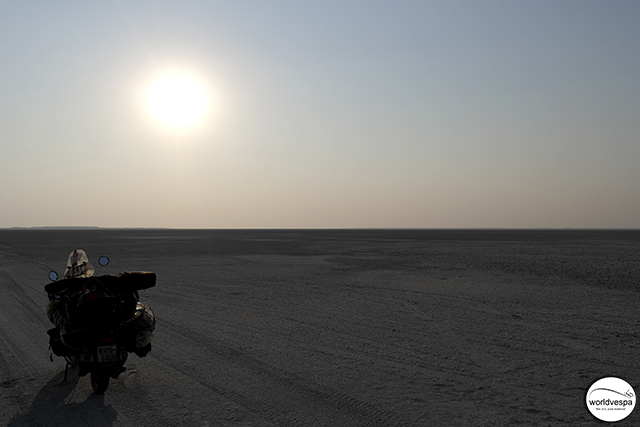 However, I was scared to continue with the risk of having to stop again in some remote place and as I didn’t want any lion to rip my tent, I decided to go back for 1-2 kms and spend the night at a campsite nearby. The previous day I saw a leopard and some elephants and the night I slept in that campsite (we call them “lodges” here), I could hear the lions roaring! 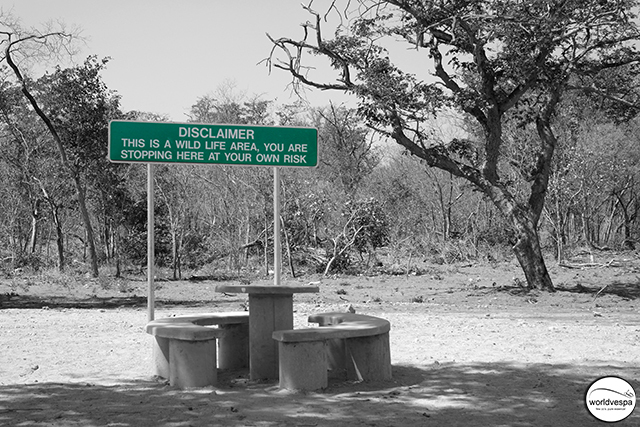 From the moment you enter Botswana you realize how many wild animals you are about to see, because there are warning signs everywhere “You are stopping here by your own risk, this is a wildlife area” etc. 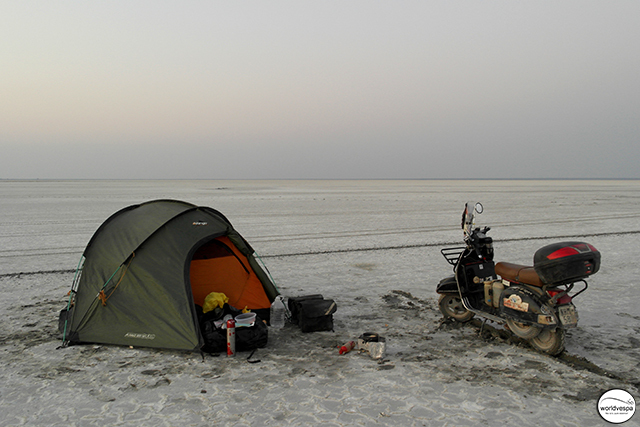 I was very lucky because at the “Elephant Sands”, the campsite close to the waterhole where the elephants gather, I met a guy from Makgadikgadi who had spent all his life in the area around Makgadikgadi Pans and the last minute before I leave to go there, he gave me some priceless advice which saved me from having to change clutch disks once more. That region I intended to visit used to be a huge lake at the size of Switzerland that dried up some thousand years ago. 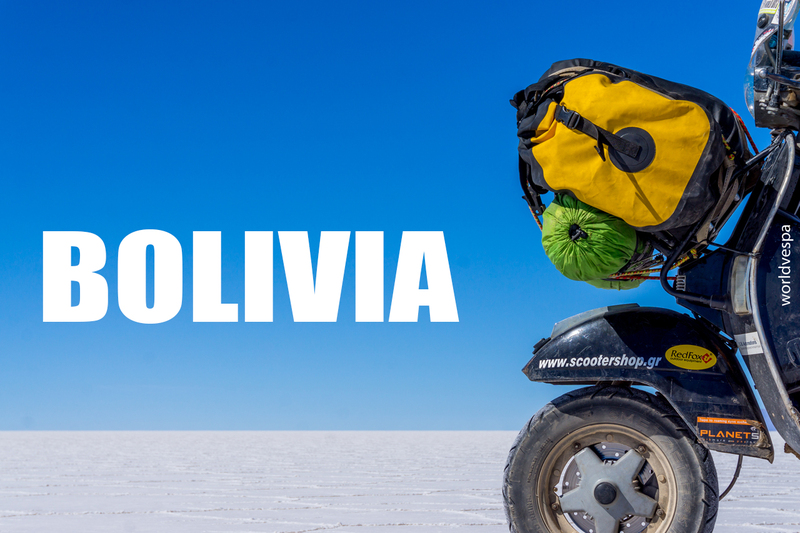 The years passed and the taxes were raised and the unemployment rates also raised and the lake dried from sadness, but at least now it is the second largest salt pan in the world, after the Salar de Uyuni in Bolivia. Same as the majority of tourists, I also decided to head to Kubu Island (“island” from the time it was surrounded by water), but without knowing anything about the condition of the road. What worse could happen than a broken clutch? I had already burnt some disks before, it’s difficult the first time but you get used to it eventually! However, I followed the wise advice given to me and chose another route to take. The road was not paved but it was in good condition and the most significant part: I was the only living organism for many kilometers! This last part about being all alone, at first was good but when I got lost, I regretted for not having marked my route with pebbles or at least, having saved it in my GPS! Thankfully, the Vespa-God helped me find it again. I tried to drive on the salty surface but as my tires were not wide enough and the vespa was loaded with some hundred kilos, it sank. So I stayed on the road and pitched my tent exactly next to it. I boiled some potatoes, and ate them with the bread and tomatoes I also had in my bag. It was one of the best dinners I had in my life. Then I slept there, in the middle of nowhere, under the sky which was full of stars and hearing nothing but the wind. The next morning I headed to Maoun, a town which is considered to be the best place to start a walk to the delta of river Okavango. Of course, the place is full of tourists (the whole country is full of tourists) of any “type”: from backpackers or senior travelers in groups, to overlanders on fully equipped 4X4s that make the equipment for Paris-Dakar Rally look like toys for amateurs! I chose to sleep in my tent at a backpackers inn, the “Old Bridge Backpackers”. The price was really low and I had my own kitchen and laundry, as well as a variety of organized activities from which I could pick the ones I preferred. Additionally to all these, I got the chance to meet many interesting people (you should check out the story of the French guy I met there, who is traveling for the last 20 years on his bicycle!). 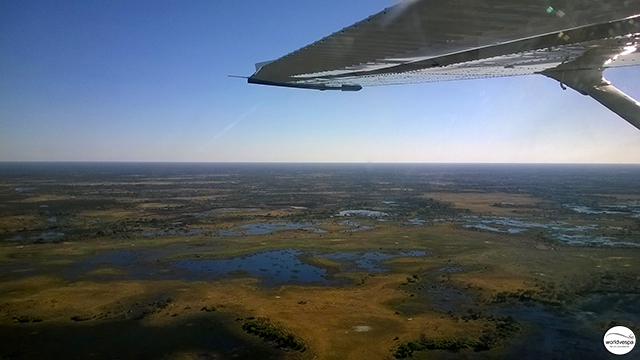 The only problem was the price of these organized activities, so I only chose a 45 minutes’ flight over the Okavango delta. The total cost was 275euros but I shared it with 4 more guys from the backpackers inn and cost 55euros per person, which was not that bad considering that there were 1 day walks on a pirogue at the cost of 80euros per person…I can’t imagine what kind of pirogues they were! Many thanks Regis (https://www.facebook.com/tontonregisafrique) for sharing your photos and videos with me! 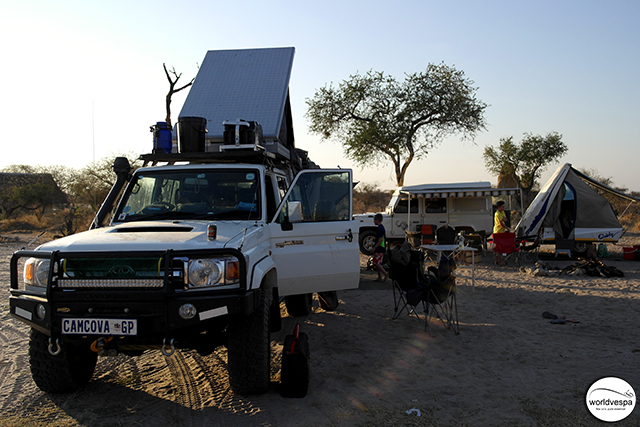 In Botswana I spent only 2 weeks. It’s not that I had nothing to do or see. On the contrary, the place is ideal for adventure, there are many national parks and you can see wild animals everywhere – even in the middle of the street. The landscape is very beautiful and as a tourist, you can find everything that you may need. There are plenty of supermarkets selling a variety of products of western origin and you can find drinks and food for every taste. 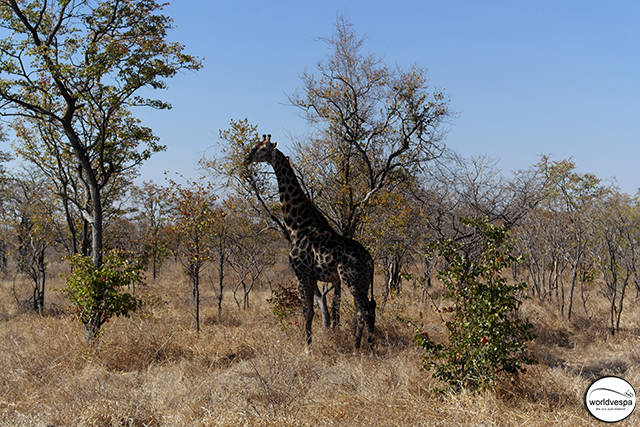 Despite all this abundance in everything, I found myself missing a lot of things in Botswana. As I already told you about Zambia also, when you have first visited countries like Nigeria, Cameroon, or the amazing two Congos, it is difficult to adjust to the huge difference. Everything seems so easy, so predictable and “normal” that you get disappointed. All the previous months I used to live in places where the ultimate chaos and craziness prevailed. But along with all these, it was the people who prevailed also. The real people! Believe it or not, there were so many similarities between all these countries and Greece that I felt like home. I always had to negotiate with someone (about just buying food or in order to get back my documents from a cop). I had to try hard in order to get to my destination and when I was there, I couldn’t find neither wi-fi, nor electricity to watch a movie on the laptop, or even just water! The other positive thing in all this lack of western products and services was that I managed to reduce the cost of my trip. If there is nothing to buy, you just don’t buy! If there is no campsite, you can just go to the next village, pitch your tent there and also make some new friends. If there is no McDonald’s, there is no problem: a nice lady who is cooking for her family is going to offer you some food. All the above, combined with the fact that I was now traveling all alone, made me speed up a little and increase the hours of riding per day! Next stop: Namibia! I was thinking not to go to Namibia and head directly to South Africa, but everyone told me that I should visit it. So, I decided to put some more oil in my engine, pay 50USD for a visa (apparently only Greek citizens have to pay for a visa to Namibia) and visit one more German ex-colony – now independent for only 24 years! Πατήστε εδώ για να δείτε όλες τις φωτογραφίες από Μποτσουάνα! Πόση μα πόση διαφορά μπορεί να έχουν δύο τουρίστες μεταξύ τους! Πριν φύγω από το Livingstone μίλησα για λίγο με μια Αμερικανίδα τουρίστρια πιτσιρικά 24 χρονών (σιγά ρε κουρασμένο παλικάρι), και με προειδοποίησε πως τα σύνορα Ζάμπια – Μποτσουάνα θα είναι πολύ ζόρικα, με πολλούς ενοχλητικούς που θα προσπαθούν να μου πουλήσουν κι από κάτι, και άλλα πολλά. Για μια στιγμή πήγα να μασήσω, αλλά μόλις μου ‘πε “θα σου πάρει τουλάχιστον μια ώρα” ήρθα στα συγκαλά μου! Μια ώρα και το θεωρείς δύσκολο μωρή; Κάτσε κανένα 6ωρο και σου λέω εγώ τι είναι δύσκολο. Άσε που μετά συνέχισε να λέει κι άλλα παλαβά και ευτυχώς ηρέμησα. Είναι δυνατόν να διέσχισα ολόκληρη τη Ζάμπια και στις καθυστερήσεις να φάω γκολ; Είναι δυνατόν ολόκληρη η χώρα να είναι στην πένα (συγκριτικά με τους γείτονες στο βορρά) και τα σύνορα να ναι μπουρδέλο; Φυσικά και δεν ήταν δυνατό. Σε απόλυτο χρόνο, ήταν σίγουρα τα γρηγορότερα σύνορα που περνάω ως τώρα (αν εξαιρέσουμε το καραβάκι)! Κανένας δεν ασχολήθηκε μαζί μου, πέρα από τους τύπους που αλλάζουν λεφτά τους οποίους όμως και φώναξα εγώ ο ίδιος. Δεν ξέρω ίσως να φταίει το μούσι, ίσως κάτι άλλο, αλλά πλέον δεν τους τραβάω εύκολα (τους ενοχλητικούς εννοώ). Ίσως να προσπαθούν να με πλησιάσουν, αλλά πλέον να έχω πάθει ανοσία και να μην τους αντιλαμβάνομαι καν! Στόχος μου να φτάσω Νάτα. Το πάρκο Τσόμπε το έχω ξεγράψει εδώ και καιρό, αφού όσους κι αν ρώτησα, παραπονέθηκαν για την ψιλή τιμή. Θα επισκεφθώ μόνον το Ετόσα στη Ναμίμπια όπως φαίνεται. Πρίν απ’ την Νάτα, περίπου 50χλμ υπάρχει ένα πολύ ωραίο κάμπινγκ που μου πρότειναν κάτι Βάσκοι. Μπροστά του ακριβώς υπάρχει μια μικρή γούρνα με νερό και όλοι οι ελέφαντες της περιοχής έρχονται για νερό. Οπότε βγάζεις τις φωτογραφίες σου μαζί τους σε απόσταση αναπνοής! Εδώ θέλω να πάω. Λίγο μετά την Πανταματέγκα (1 – 2 μέτρα απ’ τη διασταύρωση! ), έχω μόλις φουλάρει βενζίνη και ξεκινάω για τα τελευταία 160χλμ. Λέω ν’ ανεβάσω ρυθμό για να μην με πιάσει η νύχτα, και ανοίγω σχεδόν τέρμα το γκάζι θέλοντας να προσπεράσω κι ένα φορτηγό που ήταν μπροστά μου. Από το πρωί έχω την εντύπωση πως ακούω τα ελατήρια στο πιστόνι να χτυπάνε που και που, και με την κίνηση αυτή (ν’ ανοίξω τέρμα το γκάζι) άρχισαν να βαράνε σαν ντέφι! Δεν είμαι σίγουρος πως πρόκειται για τα ελατήρια, αλλά ήταν ένας μεταλλικός ήχος που σίγουρα προερχόταν απ’ το μοτέρ. Η βέσπα έκοψε απότομα κι έσβησε! Τα χρειάστηκα! Αυτό ήτανε λέω, κόλλησε! Την άφησα λίγα λεπτά να ηρεμήσει και με την πρώτη μανιβελιά πήρε μπροστά το θηρίο! Δεν ήθελα να το ρισκάρω και να μείνω στη μέση του πουθενά με λιοντάρια έξω απ’ τη σκηνή μου (μη μου τη σκίσουν όχι τίποτε άλλο), κι έτσι έκανα 2 χιλιόμετρα πίσω και πήγαν για ύπνο σ’ ένα κάμπινγκ. Από το Livingstone το κακόμοιρο το βεσπάκι με είχε προειδοποιήσει. Μια δύο φορές είδα κάτω απ’ το μοτέρ κηλίδα βενζίνης και ο μαλάκας δεν έκανα τίποτα. Έλα μωρέ φυσιολογικό θα είναι! Έτσι το πρωί άνοιξα το καρμπιρατέρ κι έσφιξα όλες τις βίδες, βρίσκοντας και την πηγή του προβλήματος (θέλω να ελπίζω). Είχε χαλαρώσει η βίδα που στηρίζει το σωληνάκι της βενζίνης στο σώμα του καρμπιρατέρ και η βενζίνη χυνόταν κάτω. Για άλλη μια φορά ο βεσποθεός Κύρου έπεσε μέσα στην διάγνωση του προβλήματος μέσω Facebook! Ήταν το πρώτο πράγμα που μου είπε να τσεκάρω! 12.00 το μεσημέρι κι αφού έκανα ένα γενικό τσεκ απ στις βίδες, ξεκίνησα για τους ελέφαντες. Με σταθερό και χαλαρόοοο ρυθμό (όχι πάνω από…60, κι αυτά κοντερίσια) έφτασα χωρίς κανένα πρόβλημα και νον-στοπ μάλιστα (με τόσες προειδοποιητικές πινακίδες που να σταματήσω) στους ελέφαντες. Από τον κεντρικό δρόμο ως το κάμπινγκ ο δρόμος είχε μπόλικη άμμο κι έτσι έπεσα τρεις φορές και κόλλησα κάνα δυο, αλλά δεν μασάω. Δισκάκια…υπάρχουν! Χτες είδα λεοπάρδαλη, ελέφαντες και το βράδυ που κοιμήθηκα στη σκηνή σε κάμπινγκ (lodge τα λέμε εδώ βρε βλάχο), τα λιοντάρια έδιναν ρεσιτάλ κελαηδίσματος! Αμέσως με το που μπαίνεις στη Μποτσουάνα άλλωστε μπαίνεις στο κόλπο για το τι πρόκειται να συναντήσεις, αφού οι προειδοποιητικές πινακίδες δεξιά κι αριστερά του δρόμου δίνουν και παίρνουν. Η τρίγωνη “προσοχή ελέφαντες” αλλά και η άλλη η πράσινη στους χώρους στάθμευσης που σου ξεκαθαρίζει ότι με δική σου και μόνον δική σου ευθύνη είσαι εδώ που είσαι (“you are stopping here by your own risk, this is a wildlife area”) είναι οι πιο κλασσικές. Ήμουν πολύ τυχερός γιατί στο “Elephants Sands”, αυτό το κάμπινγκ που μαζεύονται οι ελέφαντες, πέτυχα κι έναν τύπο γέννημα θρέμμα Μαγκαντιγκαντιντιανό, που όλη του ζωή την έχει περάσει στην περιοχή μέσα και γύρω από το Magkadikgadi pan, και τελευταία στιγμή πριν φύγω προς τα κει, μου έδωσε τις πολύτιμες συμβουλές του, σώζοντας έτσι άλλο ένα σετ δισκάκια από σίγουρο κάψιμο! Η περιοχή αυτή ήταν κάποτε, προ μνημονίου φυσικά, μια τεράστια λίμνη που κάλυπτε μια έκταση σχεδόν στο μέγεθος της Ελβετίας! Με το πέρασμα όμως των χρόνων, με την αύξηση των φόρων και της εκτόξευση της ανεργίας στα ύψη, η λίμνη ξεράθηκε απ’ τη στενοχώρια της και αυτή τη στιγμή που μιλάμε είναι το δεύτερο μεγαλύτερο σε έκταση salt pan (δεν ξέρω πως μεταφράζεται, αλμυρές έρημοι ίσως; ) μετά το Salar de Uyuni της Βολιβίας. Όπως και οι περισσότεροι τουρίστες, έτσι κι εγώ έβαλα πλώρη για το Kubu island (άιλαντ όταν υπήρχε νερό), χωρίς όμως να έχω την παραμικρή ιδέα για την κατάσταση του δρόμου. Ε, πλέον όταν πας για χέσιμο κι επιστρέφεις με κομμένο συμπλέκτη, δεν ξανασχολείσαι με τέτοιες λεπτομέρειες. Απλά πας, κι ότι είναι να γίνει γίνεται. Σαν την πρώτη φορά στον οδοντίατρο, ή γενικότερα σαν την πρώτη φορά, άπαξ και ξεπαρθενέψεις, τελείωσε! Ο μάστορας λοιπόν με διαβεβαίωσε πως θα υποφέρω πολύ για να φτάσω (αν φτάσω), αφού ο δρόμος είναι πολύ ζόρικος λόγο της άμμου ακόμα και για τα 4χ4. Ε, μετά τα Κονγκά νομίζω πως είμαι ακόμα χορτάτος από ταλαιπωρία, οπότε και ακολούθησα τη συμβουλή του και πήγα από μια άλλη μεριά, έκανα βέβαια έναν μεγάλο κύκλο (έφτασα σχεδόν στην Francistown) αλλά άξιζε αφού ο δρόμος αν και χωμάτινος ήταν καλύτερος κι από άσφαλτο, και το βασικότερο, επειδή ήμουν ο μόνος ζωντανός οργανισμός σε ακτίνα πολλών χιλιομέτρων! Βέβαια αυτό παραλίγο να το πληρώσω ακριβά, αφού σε κάποια φάση χάθηκα (ρίξε κανένα πετραδάκι πίσω σου ρε κοντορεβιθούλη να βρεις πως θα γυρίσεις ή αν είσαι λίγο πιο “προχώ” αποθήκευσε την πορεία σου στο gps) και κυριολεκτικά τα “χρειάστηκα”, αλλά είναι μεγάλος ο Θεός της βεσπας και με αγαπά, οπότε και με βοήθησε να βρω τον δρόμο μου! Προσπάθησα να οδηγήσω λίγο παραμέσα στο “τηγάνι” και να κατασκηνώσω κυριολεκτικά στη μέση του πουθενά, αλλά το βεσπί δεν μου κανε τη χάρη και βούλιαζε. Αν είχα λίγο πιο φαρδιά λάστιχα ίσως κατάφερνα κάτι. Αλλά με τα στενά και μικρά λαστιχάκια που φοράω, φορτωμένα με τόσες 100αδες κιλά, με την παραμικρή κίνηση η λεπτή κρούστα από αλάτι σπάει και τα πράγματα περιπλέκονται. Έτσι έστησα απλά τη σκηνή μου έξω – έξω και κοντά στο δρόμο, έβρασα τις λίγες πατάτες που είχα, έβγαλα απ’ τα σαμάρια και το ψωμάκι και τις ντομάτες που είχα, και απόλαυσα ένα από τα καλύτερα τσιμπούσια της ζωής μου, ολομόναχος κάτω από έναν πεντακάθαρο ουρανό και με free μουσική από τον δυνατό αέρα που σφύριζε χτυπώντας πάνω στην σκηνή μου! Σειρά είχε η πόλη της Maoun, που θεωρείται και το καλύτερο ορμητήριο για βόλτα στο δέλτα του ποταμού Okavango. Εδώ γίνεται (όπως και σε ολόκληρη τη χώρα δηλαδή) ένας πραγματικός χαμός από τουρίστες και κάθε λογής ταξιδιώτες, από backpackers και Κ.Α.Π.Η. μέχρι overlanders με 4Χ4 τόσο “προικισμένα” που θα τα ζήλευαν ακόμα και τ’ αυτοκινητάκια που τρέχουν στο Παρίσι – Ντακάρ! Για ψώνια στο σουπερμάρκετ πηγαίνεις και θαρρείς πως βρίσκεσαι σε park ferme! Εγώ όπως πάντα επέλεξα να μείνω με την σκηνή μου σε ένα backpackers (bp), το Old Bridge bp, πρώτα απ’ όλα για την πολύ χαμηλή τιμή, αλλά και για όλο το πακέτο που συνοδεύει την διαμονή σου σε ένα τέτοιο μέρος. Γνώρισα απίστευτους ανθρώπους (τσεκάρετε αυτόν τον Γάλλο που ταξιδεύει τα τελευταία 20 χρόνια με το ποδηλατάκι του!!!) από όλες τις γωνίες του πλανήτη, είχα τη δική μου κουζίνα για να μαγειρέψω το φαγητό μου, το δικό μου πλυσταριό, κι επίσης πολλές οργανωμένες εξορμήσεις στο δέλτα για να επιλέξω αυτή που μου ταιριάζει. Το μόνο πρόβλημα ήταν πως οι τιμές αυτών των δραστηριοτήτων ήταν λιγάκι…τουριστικές, οπότε και αρκέστηκα σε μια 45λεπτη πτήση πάνω από το δέλτα, σπάζοντας το κόστος με άλλους 4 τύπους που έμεναν στο ίδιο bp, και οι οποίοι ήταν πάνω κάτω στα δικά μου “κυβικά”. Το συνολικό κόστος ήταν 275€, οπότε ακριβώς 55€ ανά άτομο. Καθόλου άσχημα αν σκεφτείς το πράγμα απ’ τη θετική του πλευρά (πχ τα διόδια από Θεσ/νίκη για Αθήνα είναι κάπου στο 50ρικο κ.α.) ή συγκριτικά με τις υπόλοιπες επιλογές που είχαμε όπως κάτι ημερήσιες βόλτες με πιρόγα που κόστιζαν από 80€ και πάνω (ίσως ήταν πυραυλοκίνητες, τι να πω). Στη Μποτσουάνα πέρασα δύο πολύ όμορφες βδομάδες, αλλά δυστυχώς μόνον δύο! Δεν είναι πως δεν είχα τι να κάνω ή τι να δω, ίσα – ίσα μάλιστα που η περιοχή προσφέρεται για μπόλικη περιπέτεια, έχει τα πάρκα της και τα ζώα της για να δεις (ακόμα και στη μέση του δρόμου), έχει ποτάμια, δέλτα, έψιλον, και πολλά άλλα για να επισκεφτείς, και το κυριότερο έχει όλα όσα θα χρειαστείς σαν τουρίστας. Τίποτα δεν θα σου λείψει εδώ. Σουπερμάρκετ παντού, βενζινάδικα (ΜΕ σουπερμάρκετ) παντού, χλιδάτα lodge και κάμπινγκ (σε τιμές τόσο χαμηλές που θα ζήλευε και ο δείκτης ανάπτυξης της χώρας μας) που κάνουν τα αντίστοιχα δικά μας να μοιάζουν με ενοικιαζόμενες παράγκες, εστιατόρια, μπαρ και καφέ, να τρως και να πίνεις βρε παιδί μου μέχρι να φτάσει η ανεργία στο 5%!!! Κι όμως εδώ μου έλειψαν τόσα πολλά! Όπως σας είπα και για τη Ζάμπια, όταν έρχεσαι από χώρες όπως η Νιγηρία, το Καμερούν και φυσικά τα θεϊκά Κονγκά, δεν μπορείς να προσαρμοστείς και πολύ εύκολα στην τερατώδη αλλαγή που βλέπεις μπροστά σου. Όλα φαίνονται τόσο εύκολα, τόσο προβλέψιμα, τόσο άχρωμα και ξενέρωτα! Τόσους μήνες ζούσα μέσα στην απόλυτη παράνοια, σε χώρες που βασίλευε το χάος, η τρέλα και οι…άνθρωποι. Οι πραγματικοί άνθρωποι! Σε χώρες τόσο όμοιες με την Ελλάδα, ναι με την Ελλάδα, στις οποίες ένιωθα σαν στο σπίτι μου! Έπρεπε διαρκώς να διαπραγματευτώ με κάποιον (από την αγορά φαγητού μέχρι τον μπάτσο που κρατούσε τα χαρτιά μου και δεν μου τα έδινε πίσω), έπρεπε να παλέψω για να φτάσω στον προορισμό μου, κι όταν έφτανα δεν υπήρχαν ούτε τα ίντερνετ ούτε τα τρεχούμενα νερά, ούτε τα ρεύματα για να δεις την ταινία στο λάπτοπ. Άντε να υπήρχε κανένα ρεύμα αν άφηνες την πόρτα ανοιχτή στην καλύτερη των περιπτώσεων. Όλα αυτά είχαν επίσης και την πολύ θετική τους επίδραση στο να μειώσω τα έξοδα του ταξιδιού σχεδόν στο μηδέν. Αν δεν έχεις τι να αγοράσεις, απλά ΔΕΝ αγοράζεις! Αν δεν υπάρχει κάμπινγκ στην περιοχή, πας ως το κοντινότερο χωριό και στήνεις τη σκηνή σου εκεί, γνωρίζοντας και τους ανθρώπους! Αν δεν έχεις μακντόναλντς, δεν υπάρχει κανένα πρόβλημα γιατί στη γωνία η κυρα Μαρία μαγειρεύει στο τσουκάλι για την οικογένειά της και με μεγάλη της χαρά θα σου δώσει κι εσένα ένα πιάτο για να κόψεις λίγο την πείνα σου! Όλα τα παραπάνω, σε συνδυασμό και με την έλλειψη καλής παρέας, με έκαναν ν’ ανοίξω το γκάζι λίγο παραπάνω, και ν’ αυξήσω τις ώρες παραμονής του κώλου μου στη σέλα της βέσπας κατά πολύ. Σειρά έχει η Ναμίμπια, την οποία αρχικά είχα σκοπό να παρακάμψω και να μπω κατευθείαν στην Νότιο Αφρική, αλλά μετά από τόσο κόσμο που άκουσα να την εκθειάζει, είπα να χαλαλίσω λίγο ακόμα διχρονόλαδο κι ένα 50δόλαρο που κοστίζει η βίζα (παρεμπιπτόντως μόνον Έλληνες την χρειάζονται) και να δω πως είναι σήμερα άλλη μια (πρώην) Γερμανική αποικία, ύστερα από 24 χρόνια ανεξαρτησίας. Τσους! Maybe a bit more English dialogue when possible…. and my English degree have expired!